This is a beautiful, heart-touching story about a woman’s quest for love, soul-searching and self-discovery. Maya’s journey begins with being thrown into a black abyss of self-doubt and uncertainty after an unexpected divorce. Endless questions like ghosts arise to haunt her soul. Will she be able to find inner peace and happiness again? Will she be able to trust another man and share her love and life with him? But what she thought was the end was only just the beginning of her new adventure. Out of desperation she leaves everything she knows in her native country of Poland and embarks on a journey of self-discovery and wholeness traveling to America and then in India. Along the way she faces many challenges and gradually gains new insights and new tools to aid her in her recovery. 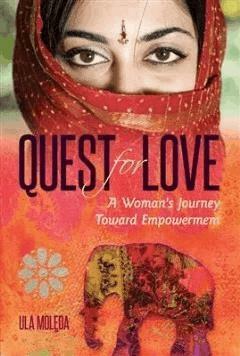 Her quest for love and spiritual truths takes her on the most difficult journey, the journey to love one’s self. I would like to thanks with all my heart to Allan, my Family and Friends for all their Love and Support, which made it possible for this book to see the light. All rights reserved. No part of this book shall be reproduced or copied in any way – mechanically, electronically, etc. – without the written consent of Ula Molęda, with exception of reviews or reports, in which case the reviewer or reporter is entitled to quote short excerpts from the book, acknowledging the source. The Polish version of this book ‘W Poszukiwaniu Siebie – opowieść o odkrywaniu siebie, miłości i szczęścia’ is available on www.tedson.pl and many other on-line book stores. You are the one responsible for your own happiness, she thought as she looked into the mirror at the end of the dark room. Its majesty was emphasized by its beautifully sculptured wooden frames. However, the reflection she saw wasn’t beautiful. It wasn’t even pretty! Happiness is a gift that you give to yourself. For the first time in weeks she laughed out loud. The conversation with the image in the mirror engaged her more and more. The words which once held great significance in her life sounded empty, almost painful, but she continued the dialogue with herself. Happiness? Does anyone know what this word really means? What feelings do we try to force into it? Don’t we cheat ourselves believing in it? Does this state exist? Or is it just another myth to appease the masses? Isn’t our life driven by empty, meaningless words? Emptiness was here like a gaping hole, an abyss into which she was willingly, gladly, slowly falling, forgetting about the reality of everyday life. One last glance into the mirror. She saw a thirtysomething woman, who was looking at her with a gaze that did not see, with eyes drained of tears and a face deformed by pain. Her once-cheerful blue eyes no longer expressed emotion. They looked at her as if they didn’t recognize their owner. As if they didn’t want to recognize her. Her eyes were dying and taking her soul with them. Discovering the truth about yourself and exposing yourself to the mirror of honesty is an act of courage, but it often involves pain. It’s an act which despite its pain is beautiful in its truth. But… All in due time. Maya was not ready for the truth about herself just yet. She knew she would someday see it. Touch it. Feel it. Not yet… She knew that reality would someday obtrusively knock on her door and demand to be let in. To have her look in its face. She knew she would no longer be able to run or hide. But all this will take place sometime in the future. Not just yet. She continued her monologue, not waiting for any signs of understanding from her friend. With tears in her eyes, Maya’s hands were trembling as she tried to pour some water into the small glasses. She spilled it on the table. Angela stood up to get something to wipe it off, but was forced to sit back in the armchair by the impatient wave of her friend’s hand. Angela listened to Maya with her eyes slightly squinted. Her bitten tongue started to hurt, but the pain was small compared to what she was feeling in her heart. This was not a good time to discuss Maya’s relationship as it had been seen by her and the rest of the world. Everyone, except Maya. This wasn’t the best moment to tell her how Tom had divided her from her family, from her best friends. How she had allowed herself to be manipulated. How she had forgotten about herself and her own needs, living to satisfy Tom’s. How she couldn’t go to the movies, for coffee or just for chit-chat without him. How he wouldn’t let her fly to see her mother, when she was in the hospital in New York, saying that the first heart attack, which she had just experienced, was no big deal, just a ‘belch from the system.’ She believed him then, just like she believed that from time to time he had to take overtime at work because he was buried in it, that he had to take business trips, which became more and more frequent during the past year. “Panta Rhei, Maya… Panta Rhei” Angela interrupted her reflections with her famous saying, as she was growing slightly impatient. To her, this was the answer for everything happening in life, the best reflection of the diversity of the world, which we try to attribute with some sort of governing regulations, laws, allowing us to find a way to live safely and with purpose. Angela observed Maya with empathy. She noticed her friend had undergone a slight change. This wasn’t just an endless monologue of a victim, but a discussion, open to suggestions. She offered Maya a piece of chocolate cake, which is always able to soothe wounded hearts but saw her shake her head in refusal. She moved the cake closer. Angela looked at Maya with complete understanding of her feelings, but also inquiringly, as if she was awaiting an answer to something which they have not been able to talk about yet. Both women burst out in uncontrollable laughter, laughing long and hard at the image of Maya looking for a woman, thereby avoiding all encounters with men – the symbols of transient love, infidelity and pain. Maya shook her head. Eating the chocolate cake, Maya felt her endorphins start to move with increased pace. As she was listening to Angela, she was arranging something in her head. From time to time, she smiled to herself with the corners of her mouth. For many days, which quickly turned into weeks, Maya stubbornly refused to do her homework on the topic of ‘My Five Year Marriage with Tom.’ She became increasingly helpless and powerless, blaming herself completely for the end of their relationship, her only relationship, with the man so important in her life. She didn’t have the strength to ask herself the questions, which could have helped her to escape the situation. The awareness that the quality of life depends mainly on the questions we ask ourselves was currently worthless. She ignored her mind, which was searching for pragmatic solutions. The emotions ripping up her heart were the driving force, and dominated these difficult weeks. They had the final say. She was feeling the same pain, lack of understanding, guilt and helplessness she had felt after losing her father. The experience of that period resounded through the feeling of abandonment, which was accompanying her once again. Six years ago, in a surge of weakness, her father made the decision to end his journey on Earth. To end his battle for a woman who had no heart. A woman, he said, who had left them for the American dream. The dream of a new, prosperous life. A little like the Hollywood movies, which so rarely reflect the true face of America. Maya did not remember her mother, but she blamed her for her father’s death. When she left, Maya must have still been in preschool. There were no pictures, no keepsakes of her in their house. She felt relief when she kept telling herself that not all women should have children. Maybe it was her mother’s cold attitude and her inability to fulfill her parenting duties that made Maya decide not to have children. She decided she would not hurt anyone in the same way she was hurt; by the lack of love. She had promised her father that she would never attempt to contact her mother. She didn’t want to be disloyal. She loved him more than anything in the world. She was as devoted to him as a loving daughter could be to her father. He was everything to her. He gave her advice in the most difficult times. She loved spending time with him, talking to him. She was his daughter, his princess, his little Maya. Only his. And then, suddenly, he was gone. He was no longer capable of living alone. He was never able to find another woman able to fill the void left by his wife. He loved her with a love Maya did not understand back then. An addictive, toxic, unhealthy love which does not allow the other person to leave, at the same time preventing her from returning. The day when she found out about her father’s suicide was the worst day of her life. For many days, she laid in bed, mindlessly staring into the white ceiling of her small apartment in Old Town. The dark room seemed even darker and more unfriendly. It was usually her oasis, a place where she could be alone or with her friends. But not this time. Now, it was just a dark harbor for a stray heart. She didn’t have the strength to cry, she was all out of tears. She stared at the sign above her door and was unable to understand a single word. It was a phrase expressed by Buddha, one she had heard somewhere and decided to paint it on the wall of the room: ‘Full of wisdom are those who live without fear, in silence and love’. In silence and love… Without fear… It was impossible for her to understand right now. However, the hours of mindless staring provided her with silent consolation of the pain. A pain so intense it would not allow her to get out of bed for the first few days. Her friends were with her. They were always there in difficult situations. They brought her food and almost forced her to eat. She didn’t resist. She didn’t have the strength to resist. She only had one question: why? And, then, one day she experienced lightness as she never had before. The walls of pain, despair and fear came tumbling down with great force. She didn’t know what had happened and how it had happened, but knew that she was able to breathe with ease for the first time in many days. The light of hope filled her completely and she felt herself growing, rising above everything that she had created during those few days. She felt herself rising out of the prison, where she had locked herself. Like Icarus, flying high through the air, escaping from the island that imprisoned him and his father, Daedalus. She felt the same lightness, the same freedom, the same awareness of space, which Icarus must have felt when he was flying over the island. Truly free for the first time; fully dependent on his own decisions. I must do everything to stay in this space. I can’t fly too close to the sun or it will melt my desire to be free, she thought, while imagining his flight. Wings made of feathers fixed with wax, which was melted by the sun. That was the end of the myth of Icarus’ creation. His strive to freedom, to his purpose, opposing the laws of nature. But, my story won’t end this way, she thought and felt the energy rising through her body. She had no more close relatives; she didn’t know her distant family. She was left alone and had to fill the loneliness somehow. Each day, she sat in silence in the corner of her bedroom. She frequently tried meditation at courses and training sessions, but she was bored by such pointless sitting. Now she was home and her actions had a purpose. Each morning, with her legs crossed and the phrase of Buddha before her eyes, she sat listening to the silence. The silence filled the body and the soul. The mind was still busy searching for answers to the questions: What do I really want out of life? What is my purpose? How can I fill my life to bring me satisfaction and happiness? What kind of relationship do I want? Who is my perfect partner? When she experienced the rare moments filled with blissful peace, devoid of questions and remorse, she tried to absorb them and teach her body to feel this way – even when it is outside of the meditational oasis. She also attempted affirmation. Short, positive phrases, assisting the drive to the desired target. She had heard a lot about it at the interpersonal communication classes; they were considered a significant element in influencing the level of selfacceptance. She remembered that they must be repeated frequently and that she must identify herself with their content. They must also be precise, cohesive and clear. Maya tried to form her affirmations as if she had already experienced the change. As if she had already experienced the internal transformation of this change. She felt the need to re-program herself, but she did not know which way to go, what to pursue, what she wanted. Usually, the solutions for such issues were suggested by her father. He was the motor of her life. Now, she had to find her own motor and learn how to drive it. She had to be the driver, not only a hitchhiker or a stowaway. I feel good. I am full of energy. She slowly began to recover her good disposition by repeating these short affirmations. She recalled the memories of the times when she felt great, when she was so full of energy and strength. She was slowly starting to feel her body giving in to those memories, to that feeling, which it begins to recognize as the actual condition. She maintained the desired image in her mind and the desired condition in her body. She listened to her body and to its reactions. For a first time, she listened to her inner voice. She was still unable to hear anything, but she was already feeling that her life was beginning to recover its color, some kind of a purpose. And then Tom appeared. They went to college together, but, until now, she had paid him no attention. Or maybe he wasn’t interested in her? During one of the workshops, where they were training in new methods of psychological assistance, she told him what had hurt her, how her mother had abandoned her, how her father had died, how she was left alone, lonely, with no tools to cope. Tom listened with care and asked if she had time for a coffee after the session. She did. She had time not only that evening, but also the next ones. Tom knew how to listen and give advice. Being a future psychologist, he had perfected these skills. He listened and his body and eyes showed more understanding than any words of consolation. They had conversations at sunsets and took walks on the beach at sunrises. They spent hours on discovering each other or studying material for the next exam. They kissed, first delicately and shyly; but, soon, turning into nights spent in her bedroom. The pain brought on by her father’s death was slowly disappearing, while a new feeling was beginning to blossom. A feeling of love for a stranger who was beginning to complete her life. The magic was in their mutual feeling. They strived to join their bodies and lift their souls above what they knew. He was her anchor, her support. He had become her friend and her teacher. She slowly began to give in to this pathos of a hero, who had her entirely to himself. His prize. She was delighted that he would want to have her all to himself. She loved and she was loved. She was happy that someone wanted to give her this feeling, which would remain forever unchanged. The fear of abandonment and loneliness slowly began to vanish and was gone completely after their wedding. Maya confidently grabbed the phone and dialed the number of her friend. “Angela, I think I’m ready to accept the truth about my relationship. I think that the time I have spent alone here, the silent hours of meditation, have allowed me to get back up on my own two feet. I still don’t have all the strength I want. There are still some black clouds in my sky. There are still moments when I want to pick up the phone and dial his number… But it’s all under control,” she smiled, and her face assumed a new expression, one which Angela had not seen for a long time. “Maya, do you see your role in what has happened? Do you see your behavior in this relationship?” Angela interrupted her with questions. “Yes, now I do…” Maya answered quietly, recalling the days of fighting and rebelling against the thoughts that she could play a different role in a relationship than that of a victim, an abandoned woman. Angela’s uncontrollable outburst made her confused and broke the intimate mood for confiding. The very thought of priests and their ‘therapy’ methods gave Angela chills, but she never allowed herself to show it in front of her patients. Maybe she wasn’t treating Maya as a patient? Maybe she felt so safe and at ease in her company that she could allow herself to be open and explode with an honest opinion? The memory of their classes and the college time spent together brought Maya back to a very positive state. For a moment, she felt as if she could achieve anything she wanted. Just like in college! Back then, she believed she could conquer the world. Andy Warhol’s famous quote, ‘Everyone has their 15 minutes’ was chanted by the students of each year. Maya suddenly was feeling free from another burden which had been with her since her time with Tom. She was free from satisfying the expectations of others at her own cost. She was feeling incoming energy and double joy: of losing and gaining. Losing the behaviors which bring pain and gaining new faith in the future. Angela had the perfect voice for visualizations and hypnosis, which she began to incorporate in her sessions as of late. The quiet voice, full of serenity and self-confidence, provided a sense of security and trust. Maya was sitting with her eyes closed, allowing her imagination to play in the future. She liked visualizations, because the products of her mind had turned to reality many times. She allowed herself to flow without limits, without fear, without guilt. She submerged herself into the world created by her mind. She was suddenly awakened by Angela’s quiet voice. “Forever and ever,” he automatically replied, expecting a different greeting. He smiled amiably when he saw her and pointed to a wooden armchair, padded with worn out leather, on the other side of the mahogany desk. She hesitated. She looked at Father George with eyes filled not just with questions, but also reproach. She was tired and this conversation was her last hope to understand her current situation. Father George saw many cases similar to Maya’s. Women, who were betrayed, humiliated, misunderstood, abandoned by partners, came to him to recover their lost hope. He knew what they needed. He knew that the hope was in Jesus and in his pain, so great, that it was able to reduce the pain of the sinners, who were pouring tears over their own failures. He told them, just as he told Maya now, of the Holy Trinity, of the Original Sin, of the Last Judgment. He spoke of the magnitude of holy matrimony and the vows made to each other by spouses. He spoke of God, who condemns us to certain experiences, but who still loves us and is waiting for us to return to him with greater faith. He also spoke of Jesus, who had suffered so much for us and offered his life for the salvation of mankind. Maya was not usually prone to such outbursts. Not in front of Father George! She knew him from the school, where they both worked, and didn’t want her private affairs to become a topic among the teachers. But this conversation was different. This was a bridge for her; she would either cross it over to the unknown side, or remain on the familiar one. “No, it does not… But there is great truth in it. The existence of the merciful God provides mankind with a sense of happiness and safety. It provides meaning to existence, which they consider meaningless. Maya, do you remember the life of Job, from the Old Testament?” Father George was obviously unconcerned with her outburst. His long experience as a school teacher had made him accustomed to such questions and he knew how to answer. Father George listened in silence, observing the young woman going through such misfortune. He did not interrupt. He waited. He knew he had to wait out the volcanic eruption of emotions in order to reach Maya, who continued to talk, covered in tears. “But you didn’t have children?” Father George still tried to understand the cause of the annulment. “No, we did not. We both decided to put it off. We had both just graduated from college a few years back and wanted to live a little… without children. But Tom found another woman. He says he doesn’t love her, but she’s expecting a child… Their child,” Maya finished the thought, unaware of where the priest’s questions were leading. Maya was unable to stop the scream of outrage from bursting out of her mouth. She was incapable of saying anything more. She was unable to get up, feeling the roof of the Lord’s House crushing her with its weight. She fell into the depths of the armchair and sat motionless for several minutes. Thinking that Maya was giving herself time for reflection, Father George respected her silence and remained silent himself, awaiting her answer. The moments turned to long minutes of silence, of Maya’s internal battle and the awaiting of Father George, who was oblivious to the weight of his words on her life. Maya slowly opened her eyes, which were no longer filled with fear and shock, but rather indifference and aversion. She rose from the armchair, ready to leave, but stopped in the middle of the room. “Nobody will ever make me feel guilty again,” she told the surprised priest in a confident voice. She was sitting on her couch, listening to Chopin. The nostalgia flowing through every sound brought her even more pain, but she was unable to get up and turn it off. Fixed in her place, she tried to imagine what Frederic must have felt when was leaving Poland, when he was leaving his family. Was this the pain present in his work? Or was it the pain of unfulfilled love? Maybe the music allowed him to cope with such feelings. Words are not always the best way to reflect what you feel. Love? And once again, the image of Tom was back in her imagination. Whatever she did, whatever she thought of, this inside image remained in her head. She wanted to erase it, to cast it away – but it just kept returning. Finally, she spontaneously began to play with it, changing its brightness. A while back, she attended a workshop, which had an interesting, hard to remember name. She tried to recall it. Neurolinguistic programming, she thought, delighted with the triumph of her memory, or mind manipulation, she added in her thoughts. She remembered that the method was abbreviated as NLP. Its cocreator, Richard Bandler, believed that if men did not have selfcontrol and conscious use of their minds, they would be controlled by others. They played with the images of their own imaginations, presenting events to which they desired a different emotional approach. She laughed in her thoughts, remembering the class, and returned to her game. She decided to pursue the new, surprising feeling, which suddenly appeared with the changed brightness of the image. In her mind, she tuned the brightness of what she saw, as if she was tuning a TV screen. The clear image of Tom, telling her he was leaving, frightened her. She changed it immediately and began to turn the imaginary dial in a different direction, in order to dim the picture. Now, it was darker. She understood the changes occurring in her feelings. When the image was bright and alive, she was feeling the intensity of her feelings; but, when she turned it down so the image was dim and not clear, her feelings grew weaker and more distant, to some unknown place. Amused, she started to play with the distance of the image. The game absorbed her so much, that she didn’t even notice when the music had stopped. Bringing the image of Tom closer was not a good experience, causing greater and more intense pain, just like its brightening. But moving it away was miraculous. The image slowly drifted away and left a void, not only before Maya’s eyes, but also in her heart. She kept playing. She enlarged and reduced it, made it static or allowed it to move, like in a movie. She framed it with various colors or left it unframed. Exhausted, but filled with the faith of possessing a new tool to cope with Tom’s absence, she fell asleep on the couch. Another day. Another low. A load of questions with no answers. She was tired by these emotional swings, but she was unable to control them. Or maybe emotions couldn’t be controlled? Maybe they were the ones controlling us and not the other way around? After releasing her doubts, grief and tears, she was attempting to listen to what Angela was saying, but it was very difficult. Angela was with her friend during these difficult times. They saw each other every day in Maya’s apartment, at least for a few minutes. But today, she was tired from the conversations with the addicts and their families; she didn’t have the strength to listen to someone so close to her, who was plunging into darkness. What Maya did with the images during the previous day was excellent news, but her high self-esteem had died with the morning. She was once again sinking into her negative perception of reality. Exhausted from listening, Angela assumed the approach of the therapist in her office. “It’s hard to protect your soul from questions about the purpose of our existence,” resigned, Maya was sitting in the armchair, passing a glass of water to her friend. “Because unprotected and bombarded with questions, it will suffer, and…” Maya did not finish her sentence. Angela was slowly losing patience for Maya’s submissive attitude. This was not the way she had perceived her friend. Deep in her heart, when she found out that Tom left her for another woman, she had hoped that after a day of crying, a week of suffering, eating an entire chocolate cake, Maya would once again become the Maya of old: happy, alive, full of vital strength. But it was not the case. It had been several months and Maya was still unable to escape the dark cave of being the victim. She got up, walked to the closet, took out a warm sweater, and put it on. “I need their warmth,” she concluded. She embraced her tired body and delicately stroked Maya’s hair in motions filled with friendly love. Maya was like the sister she never had. She had been with her when Angela went through a similar experience in her life. She shared her pain and her happiness. She couldn’t leave her like this now. She must somehow help her get out of this! As quickly as possible! Her face was filled with tears. She tried to add something, but changed her mind. “Yes, but it also kills all of its students,” Maya harshly said through her tears. “Okay,” Angela smiled. “So maybe experience? Maybe experience is the best teacher?” she lost herself in her thoughts for a moment. Maya was unable to answer this question. The wounds were still too fresh. Open. Will she ever find the cure for them? Or will they remain in this state, open and scorching? Angela refused to quit. She knew that her friend was trying. But all of her attempts ended in feeling good for a day or two, which was once again followed by the dark clouds looming over her head. Angela knew that Maya was in need of some kind of a breakthrough. But what?! How?! The affirmations, meditation, visualizations… Good tools, but lacking the depth, which Maya so badly needed right now. She needed a deep transformation. The removal of dead stumps and the planting of new trees. “Not everyone wants changes. Not everyone is ready for changes,” Maya was visibly angry. “I associate changes with risk. And risk is dark and unknown, big and dangerous. “Think about the risk,” Angela interrupted her, and wanting to abandon theories, decided to conduct a practical exercise, which she had used with her patients. Aware of Maya’s experience with the internal image game last evening, she decided to apply it. When she had heard her description of risk, she decided to dig deeper. “What should I see?” Maya had no idea what Angela was talking about. “What am I supposed to see?” she asked again, full of confusion. Slightly confused by the sudden change, Maya silently succumbed to the confident voice of Angela. She nodded. “Now imagine that the image is shrinking. All right. Brighten it up. Is it bright? Touch it, and carefully observe it. Look at every detail. Explore it,” Angela paused. “Are you acquainted with it?” she asked after a while. Led by her friend, Maya obediently performed the exercise. She trusted Angela to the point of following her orders without a trace of doubt and questions. Angela felt confident in her therapist role. She loved to apply short, effective NLP exercises on everyone who agreed. “It’s clear, it’s fresh, and I want it in my life!” after several minutes, she heard Maya’s surprised but joyful voice. She couldn’t believe in such quick transformation. They fell into each other’s arms. Happy, with teary eyes, they hugged for a long while. They were both aware that the changes in life were inescapable. Panta Rhei. They knew that it was Maya who had to take responsibility and decide what she wanted to do with her life… how to live her life. If she would remain in the role of the victim and martyr, she may bring herself to a condition which would not allow her to get out of bed. She could also live her life dedicating herself to others and find her purpose in this. It is possible. Angela saw such cases in her office. There were women who had wasted their entire lives to satisfy their partners, children, mothers-in-law, family, locking their own needs in a big chest. They had the key, but they pretended they either didn’t or that the whole chest did not exist. There was also another alternative. This was the time for Maya to make the decision on taking care of herself, her needs, her identity and her actions. The greater the choice, the greater the independence, Angela thought, happy to see her dear friend slowly waking up from the dark night. “How do I open it?” Maya seemed slightly impatient. They were sitting on the sofa in her cozy apartment, once again attempting to bring meaning to Maya’s life. To recall what was important to her; what brought her joy; what were her goals. For the first thirty minutes, they were writing it on a sheet of paper; but, when the conscious part of Maya’s mind completely rebelled and refused to cooperate, Angela got the idea to use its other hemisphere and lead Maya through visualization. Maya allowed herself to be led. Angela’s monotonous, quiet and confident voice always had this effect on her – like sleeping pills. The difference was that Angela would not let her sleep. She had to remain in a state of conscious relaxation. Maya intensively searched for the key. What brought her true happiness? Walks on the beach? Chocolate cake in her favorite Sopot café? Reading? Listening to good music? Dancing? Her face lit up with a smile. Garden. She returned after a short while and resumed.